1. Please read the ENROLLMENT PACKET in its entirety. Print two copies. Submit one copy with BOTH parent signatures to your instructor on the first day of lessons. Retain the second copy for your records. 2. Please read the WAIVER OF LIABILITY in its entirety. Print two copies. Submit one copy with BOTH parent signatures to your instructor on the first day of lessons. Retain the second copy for your records. 3. Complete the REGISTRATION. This provides you instructor with critical information to keep your child safe during lessons. If your child has any medical history that could affect lessons, please be sure you communicate with your instructor well in advance of lessons. Providing safe lessons for your child is our priority and the more we are familiar with your child's medical history, the safer we can be. There is a $50 registration fee for the first year of lessons for each child. The second year registration fee is $25. If you return for refresher or maintenance lessons after that time the registration fee is waived. 4. IMPORTANT: Please CHECK AVAILABILITY to make sure there is a time that works for your family prior to paying. Pay online using PayPal. If you have scheduling or any other concerns, please address them prior to completing the registration as there are no refunds for registration fees. Bring a signed copy of this form to your instructor on the first day of lessons. Lessons are $85 per week per child. The first week lesson fees are due at the time of registration. 5. Choose a time and SCHEDULE LESSONS. Once you have completed the previous steps, you will be ready to choose a time for lessons. We will do our best to accommodate your request. Reservations are taken first come, first served based on submission and payment of registration fee and first week lesson fees. No child's lessons will begin until the child previously in that time slot has completed his/her lessons. 6. Need swim diapers? 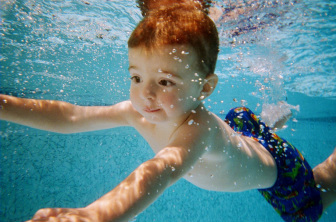 Visit our ONLINE STORE for toys, flippers, swim diapers, rash guards and more. 7. Getting Ready for your first day of lessons? Read What to expect on the first day.